One is a French Angora litter: a broken copper agouti doe, a broken copper agouti buck, two broken chinchilla does, and a white doe. 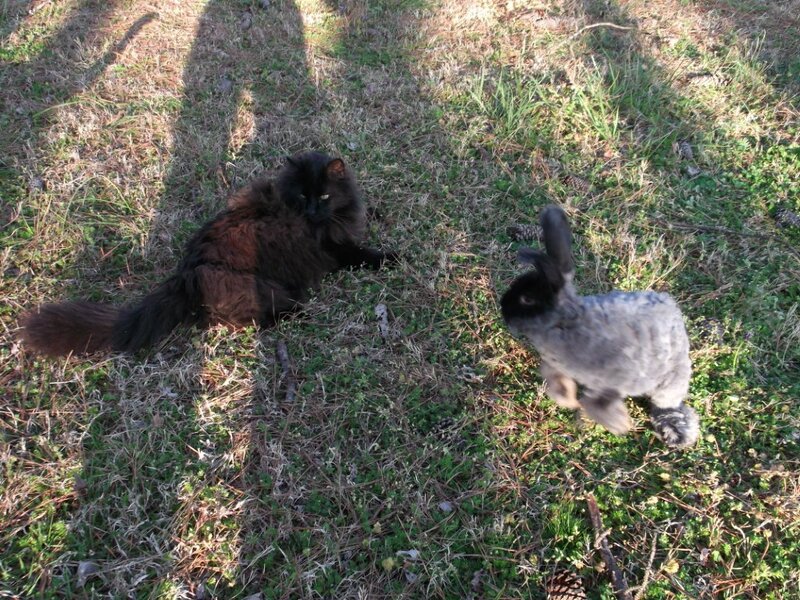 I also have a 94% German Angora litter: 3 chestnut bucks, 3 white does, a white buck and a black doe with a white leg. This entry was posted in Uncategorized on April 30, 2013 by bamaangoras. I always get a lot of questions on breeding, specifically line-breeding and inbreeding and the difference between the two. It is a hard concept to grasp when you start out because it is not something we humans practice – in fact there is a huge cultural taboo against mating with any relative. The difference between us and the rabbits is that we control which rabbits reproduce and line-breeding is the only way to improve the quality of our lines. All modern breeds where created by line-breeding; the Chihuahua and the Great Dane all had the same ancestors. Even breeds we think of as “native” were line-bred, just breeding was limited by geographical area instead of human guidance. When you start to consider breeding and read the books, a lot recommend getting a trio, or two does and a male. So most people, doing what seems logical to humans, go out and pick three very nice, completely unrelated animals, start breeding and end up with…mush. Their litters will be all across the board in quality. So they will pick out the best of the babies and since they do not want to mate the baby to a parent, will go out and find another completely unrelated animal, breed the two and end up with…more mush. So what is problem here? The problem is that even the simplest genetic structure is incredibly complicated. Most people have a hard time understanding color genetics and that is relatively simple. A lot of genes contribute to even one attribute. Say your buck has lovely hips and you pick out a doe with good hips as well. There is no guarantee that the babies will have good hips because the buck might have gene XY contributing to his hips and the doe, WZ and the babies might get XZ or WY which causes cowhocks. And this is why we line-breed. If instead the doe was a cousin of the buck and so she had WX instead and was bred to the same buck, the babies would have a far greater chance of ending up with XY or WX than the dreaded WY. To put it another way, I like to use the analogy of working with clay. When you first start out you want the clay to be soft and malleable so you can try to mold it the way you want. As soon as you get something close to what you want, you let it set, or dry out a little so it stays in its shape. Then you can start adding a little water to the areas you want to change so you can start refining the sculpture. If you add too much, you turn it all back to mush; if you add too little, you are stuck with what you have. Line-breeding is like setting the clay – it “fixes” attributes so they are hard to change without adding a lot of “water” or new bloodlines. 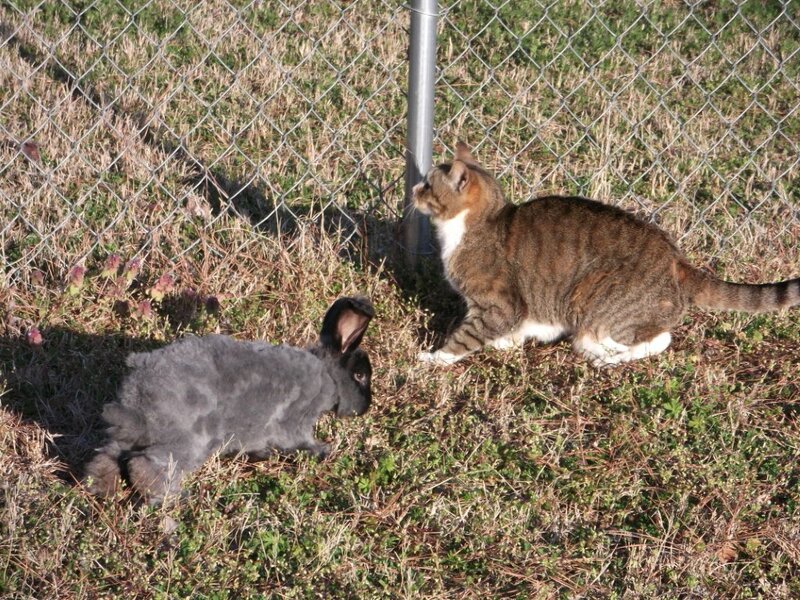 You do not want to set your rabbit line too quickly or it will be stuck and you will have to start over by outcrossing, but if you continually outcross you will never get consistent quality in the animals you produce. As an example, say the best rabbits I could find are a doe with a white toenail and a buck with pinched hips. I breed these two and they produce two kits out of a couple of litters, buck(A) and a doe(B), without either fault. With the rabbits I have, I have two options breed the babies back to their parents or breed them together. I do not want to breed them back to their parents because I risk “setting” either the white toenail or the pinched hips into the line. I do not want to breed them together because the pinched hips or white toenail might be a recessive trait (or a hidden trait that only shows up when two copies are present) and the resulting litter would be full of unacceptable rabbits with the trait “set”. The best option in this case is to “throw another handful of water on the clay” and find another rabbit. So I go out and the best rabbit I can find is a buck with a screw tail. I breed the new buck to the doe produced from the original set of rabbits and produce half nice rabbits, half screw tail rabbits. I pick a nice buck(BX) and doe(BY) out of the litter. I do not want to breed the doe(BY) back to her sire and risk setting the screw tail trait, and I do not want to outcross again and risk adding new problems, so I breed the buck(BX) to his mother(B) and the doe(BY) to her uncle (A), to try to “set” the attributes of the buck (A) and the doe (B). You continue on in this manner, always aiming for your perfect rabbit. 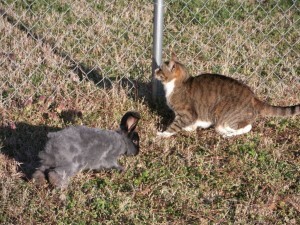 Do I already have a rabbit that complements this one, or does not have or carry the faults that this one has or carries? If yes, then breed the two and keep the best resulting kit. If not, then look for another rabbit that complements yours and start over. The other important thing to keep in mind is that the closer the relationship between rabbits mated (half-sibling, mother-son, father-daughter), the quicker the traits will be set so you might inadvertently set an undesirable recessive trait like poor mothering ability or cryptorchidism. The longer you have been line breeding, the less likely this will be since you would have already identified the bad recessive trait and removed the carriers from your line. The only breeding that is generally frowned upon is full brother-sister pair. This is because it is not only a close breeding which we know strongly sets traits, it is also impossible to guess which traits will be set because we do not know recessives they inherited from their parents. It can be done, but it is very risky – you could end up having to cull the entire litter or the entire resulting line due to the recessives, and you will not likely have a market for the kits – most buyers are hesitant to buy from full-sibling matches. This entry was posted in Uncategorized on April 20, 2013 by bamaangoras. These guys are weaned and ready to go. They will have a lot of density. I have 2 black (self chin) does and 1 black (self chin) buck, 2 white does and 4 white bucks, and only 1 chinchilla buck. They are $50 each. Update 4/30 – only a couple of white bucks left. This entry was posted in Uncategorized on April 6, 2013 by bamaangoras. I let some of the 3 month old juniors out for the first time to play. It was peaceable kingdom until a certain rascal decided it was fun to chase the cats.